Deliciously crunchy oven-baked clusters of wholegrain oats, barley, blueberries & apple pieces. Mixed to perfection in the Austrian Tyrol to a traditional recipe. Purely organic. Guten Morgen! 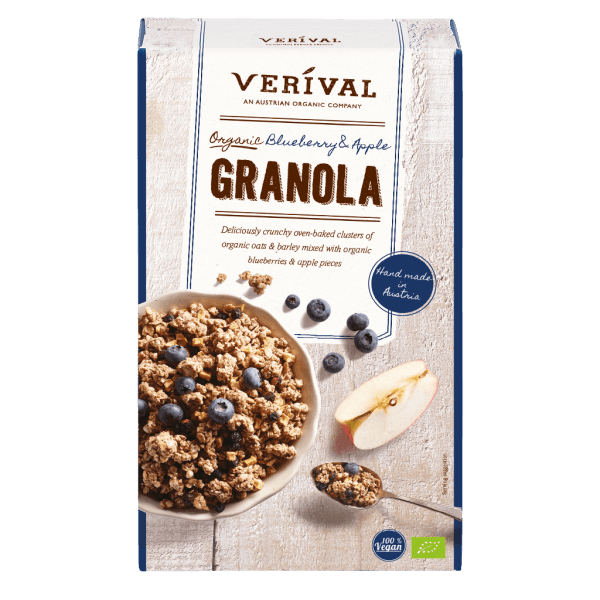 Wholegrain oat flakes*, cane sugar*, wholegrain barley flakes*, high-oleic sunflower oil*, grape seed flour*, coarsely ground oats*, wholegrain crisped rice*, apple cubes* 3%, blueberries* 1%, aronia powder, natural flavour: blueberry 0,3 %, salt. Best enjoyed with milk, natural yoghurt or plant based alternatives from almonds, coconut, oats or rice. Feel free to add extra fresh fruit if you wish, and eat straight away to enjoy this granola at it's crunchy best! Also perfect as a topping for your breakfast bowl or a nibble on its own. A deliciously satisfying snack, anytime.